... his paintings of Sydney Harbour with their oceans of Ultramarine, his celebrations of Lavender Bay where he lived overlooking the Harbour, his series on waves that reference Taoist philosophy and Japanese water paintings. 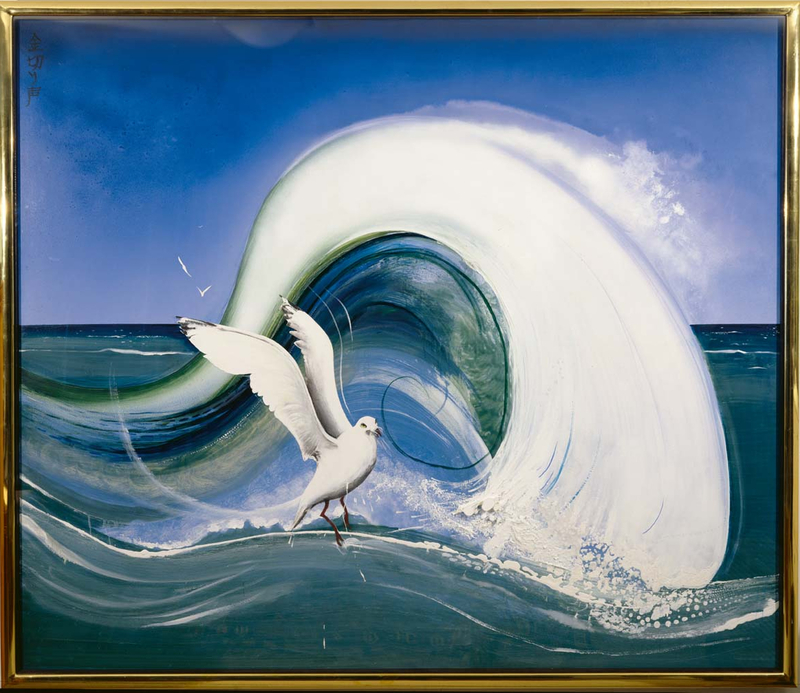 (Prophetically enough, i see in this weekend's The Weekend Australian Review that Savill Art Galleries is offering Whiteley's Seagull (1988) for sale - the painting featuring a large white breaking wave). ... but also his whole life. This was a life not so much writ on water as one of walking on water. Indeed, waltzing on water. He saw painting as riding a fluxus, the artist as one who who plumbs the unconscious to retrieve its pearls as images, arts culture as a pool of illusions and tricks, and fame a wave to be surfed. ... yet i am left with the sense that he was always secretly afraid of sinking. The image i have created contains a touch of surrealism as homage to Whiteley, the Australian Surrealist. 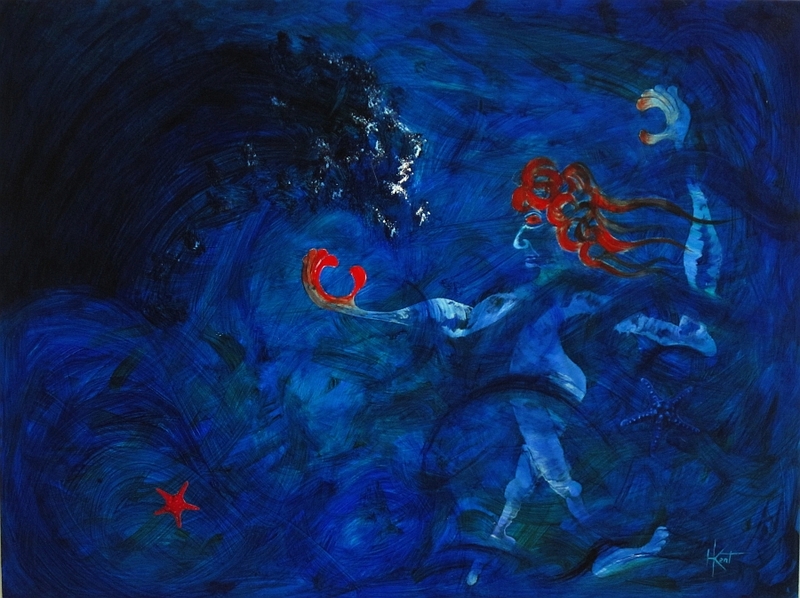 It contains an elbow from Salvador Dali, the Sorcerer's Apprentice from Fantasia (battling the odds of mad and mystic water), and Schubert's Erlkönig wooing us away. The image is ambiguous. Is the figure a demonic and omnipotent magician conjuring the wave? Or is he being overwhelmed and drowned by the tsunami of fate? Is he pirouetting with glee before sublime immensity or is he defensively fleeing the overwhelming darkness? BW wanted to believe enough in his giftedness to enable him to walk on water ... to be superhuman, semi-divine, a mediator between Man and the Gods. But in fact he was all too human. Daedalus-like, quietly he sank one night in Thirroul. But it was not defeat for i also see him dance Zorba's dance of triumph-amid-catastrophe in the deserts of the heartland. Ah, but we who remain have not forgotten. Beautiful work, Harry, and I was just wondering where you would take this series next, or where it would take you! Not sure why, but this image and your words about BW made me think of Robert Frost's famous quote about poetry : "Like a piece of ice on a hot stove the poem must ride on its own melting." One could easily say the same of the poet himself, or any artist who braves the extremes. Hope all is well with you! Thanks, Gabriella. I think i'm almost at the end of the series. Love the Frost quote. It helps me accept the blind groping forward punctuated with spells of down-time. Sometimes i wonder if i even have enough left in me to keep going and finish. Captivating, both dark- and light-hearted. Hi Jean, and thank you. Yes, i was thinking about BW with a kind of grim whimsy. Lovely of you to pick up on that. Do I see two figures? One the apparent BW conjuring the the dark BW? Or is he trying to ignore his darker self? Is fending it off? Is it overtaking him? The ambiguity of this is its strength. So many questions so much to talk about. That's what I like about art—to be engaged in conversation. Thanks for responding to the ambiguities, Davida. I guess there is some element of self-portraiture still running through this series and so your questions are terrific when i apply them to myself. "Is he trying to ignore his darker self, is he fending it off, is it overtaking him". Great questions! incredible Harry I see a figure dancing on a knife edge, steps of the figure are carefully calculated.Harry, this dancer is not allowed to miss the step! Congratulations for your skill and balance!! Thanks, Paulo. You are always so positive in your comments. Much appreciated. Ciao. I enjoy viewing your work as much as reading about your past life. I suppose we are all intuitive creatures living on a small rock spinning in this wondrous thing we call the universe. Roberto Matta, a former teacher of mine from the late sixties once said something like this. . . :Painting as fast as one can, releases the unconscious mind and places us in an intuitive realm". To stand out of the way. . . I'd be interested as to what you make of this. Maybe it's just a matter of taste, but i'm not one for conceptual art. I believe painting is first and foremost an emotional communication and the more we think out our emotions the less emotional they actually are. Working fast is a great way of avoiding that. I agree completely with Matta. Painting fast minimises conscious control. It throws you back on your instincts. There is nothing as exhilarating when the work is awash with moving paint and you somehow have to coax it into an image before it all sets. Which is why i am so rapt in the agency of painting media. I think Francis Bacon once said something about painting 'deeping the mystery' rather than merely illustrating appearances. I guess that is my quest too.